A strong summer sun beamed from cloudless skies. A soothing breeze came in with the smell of the Sea on it. The coast could not be far beyond the horizon. 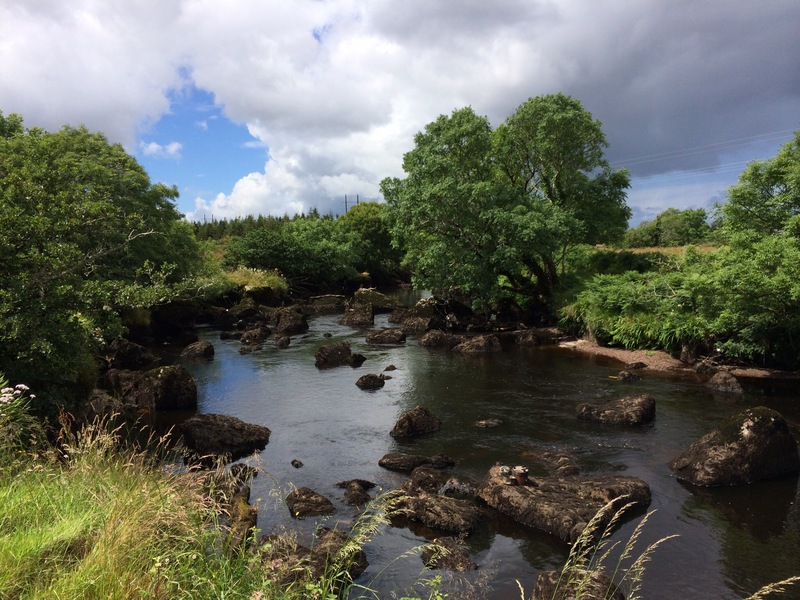 It was a hot July in County Donegal and I had again returned to the Bluestack Way. Something about the trail holds a mystery, I’ve always known I’ll return time and time again to the Bluestack Way. I’ve also always known the Bluestack Way will hold some importance for me, but on trying to rationalise the intuition it melts away: a half remembered dream of some sort. My first attempt at the Bluestack Way left me relatively unimpressed as I hiked through road and Tarmac to the next village and back. I was to find out later by the fireside of the local pub, to much amusement, that I had actually walked the main road from Ardara to Glenties. The Bluestack Way had eluded me. I resolved to return better prepared with a map and compass to discover the secrets of the Bluestack Way. Prior to going walkabout I also consulted a local guidebook on the area: In Connell’s Footsteps by local Historian Dr Lochlann McGill. A mixture of field guide and history chronicle of the local area, the book brings the local area to life as you walk in the footsteps of the mysterious St. Connell and are treated to an expert guide of the lay of the land, it’s history and people. This is the first time I’ve used such a field guide and found it added to the experience immensely. A little knowledge transforms the landscape and colours it with the ghosts and legends of the past. 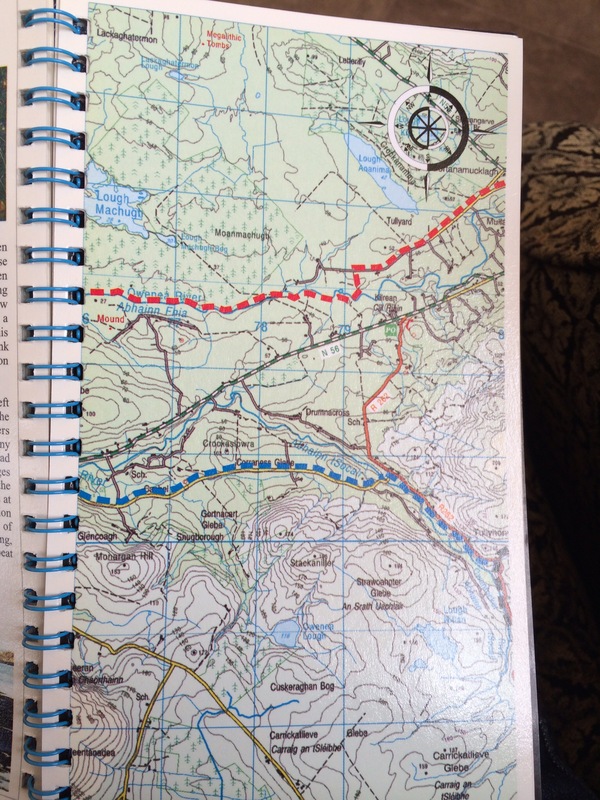 My journey was to walk the last section of the Bluestack Way between the costal town of Ardara to the town of Glenties approximately 10km along the trail and back again. I waded through thick undergrowth and realised that keeping the Owena River to my left meant I couldn’t go wrong. I picked up the pace to a light jog and skipped between rocks and riverbank: the broken rhythm of calculated footwork continuous: like Jazz. 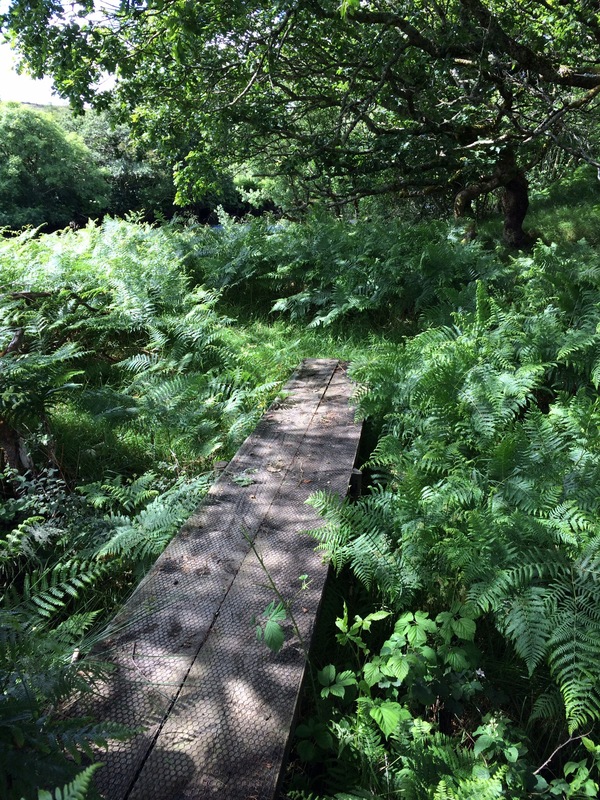 For a second I was reminded of playing Indiana Jones as a child in the local park and for the rest of the afternoon I indulged the childlike joy of exploring a new trail, a new place… Every face unfamiliar and every turn on the path a new experience. Keeping the Owena River to my left felt comfortable as a guide however I was to discover that the exercise was entirely needless as the trail is extremely well way marked and even without the river feature it is near impossible to get lost. I also found the trail itself to be in an excellent state of repair with sections of path created over the worst of marsh and bog. Despite the beauty of the Bluestack Way it appears to be a relatively hidden track and one less travelled by. My recently self taught tracking skills told me the newest spores on the track were 3 days old on the journey out to Glenties. In the height of Summer I encountered only another two Souls on the journey both there and back. German backpackers had walked the trail from Donegal town and were pleased when I jogged past them and stopped to say hello. They were particularly pleased when I was able to tell them the end of the trail was less than 2km away. My basic words of German (learnt mostly from TV) were well received and the encounter left a pleasantly international feel. The Bluestack route incorporated into the International Appalachian Trail and I could think of no finer trail to represent the Irish section that day. Stopping by a bank near the river and basking in the high afternoon sun I thought over his words. Lighting a cigarette and dipping my feet into cold water I listened to 10 minutes of pure silence and concluded that after a while the silence could get deafening. Perhaps that’s why Thomas fled the area. 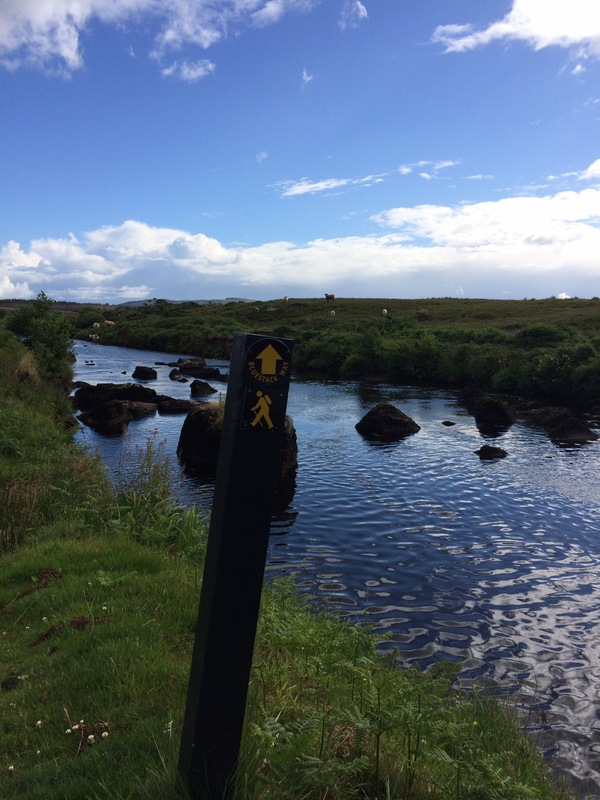 After tea and scones in the town of Glenties I took to the trail once more and followed the route back towards Ardara, navigating the same route backwards but still maintaining the delight of exploring a new path with all the wonder of exploration that entails. I will return to the Bluestack Way time and time again. For me it embodies all the best of trail hiking with the beauty of the Donegal Hills as a setting. With inclusion into the International Appalachian Trail you’ll also be able to say you’ve walked a section of the Appalachian. Even if it is in your back yard.